Every country in the world that has a border on the ocean has a traditional fish or seafood stew. 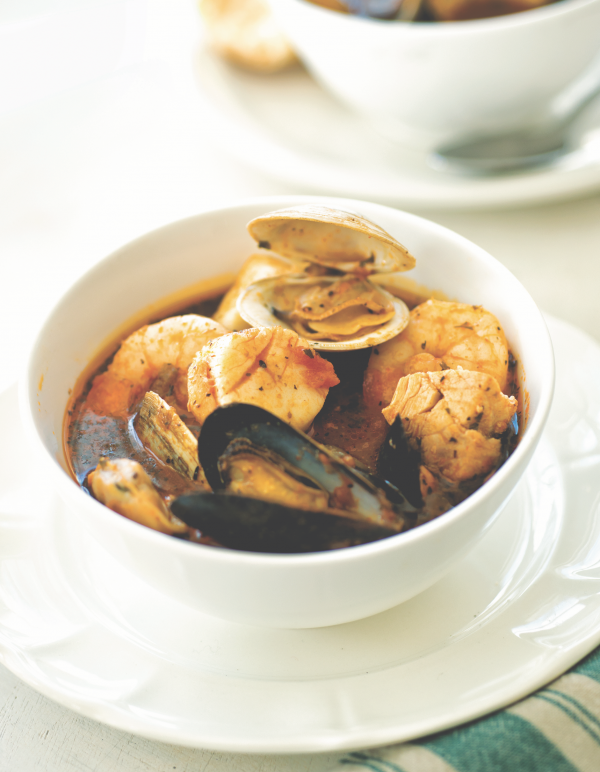 An Italian version, cioppino, is one of the best. This dish, submitted by our good friend Peggy Greenhut Golden, is a good example. The great aspect of this dish is that the fish and shellfish can be changed every time you prepare it to keep it fun and different. Heat the oil and butter in a large Dutch-oven pot. Add the onion, garlic, green pepper, and mushrooms. Sauté for 10 minutes or until the onion is limp. Add the tomatoes, tomato paste, wine, clam juice, lemon juice, parsley, bay leaves, oregano, basil, salt, pepper, and sugar. Heat to a boil. Reduce the heat and cover. Simmer for 1 hour, stirring occasionally. Add the fish. Cook for 10 to 15 minutes or until the fish is flaky. Add the clams (or mussels), shrimp, scallops, and crabmeat. Cover and simmer on low heat until clams (or mussels) open. Discard any clams that do not open. Serve in large, flat soup bowls. Mix the mayonnaise, curry powder, and lime juice in a small bowl. Put a dollop on top of the fish stew. Made this Cioppino for dinner this week…..so delicious!!! I used the scallops, shrimp, crab, and cod. Easy to make, and amazingly delicious. I will make the broth to freeze and then add fresh fish in the future. Thanks for sharing!